Barbecue Chicken: Thai Style | What about this? Think Thai. Think of some of the most aromatic and flavor-packed ingredients that go into Thai cooking – lemon grass, ginger, coriander, and fish sauce. Think about expanding your barbecue repertoire. Think about the option of grilling outdoors or baking indoors. Think about a perfect dish to serve at a summer party. Think about eating juicy pieces of delicious chicken. Need more encouragement? Click on the photo to enlarge it. Okay, stop thinking now. Go out and buy the ingredients to make your own exotic Thai barbecue chicken for dinner tonight! 1. Here’s how to make the marinade: Cut off the lower 2 inches of the lemon grass stalks and chop them coarsely. Put into a food processor with the ginger, garlic, shallots, coriander, sugar, coconut milk, and sauces. Process until smooth. 2. Place the chicken pieces in a dish, pour over the marinade and stir to mix well. Cover the dish and leave in a cool place to marinate for at least 4 hours, or leave it in the refrigerator overnight. 3. Prepare the barbecue or preheat the oven to 400°F. Drain the chicken, reserving the marinade. If you are cooking in the oven, arrange the chicken pieces in a single layer on a rack set over a roasting pan. 4. Cook the chicken on the barbecue over moderately hot coals or on medium heat for a gas barbecue, or bake in the oven for 20–30 minutes. Turn the pieces and brush with the reserved marinade once or twice during cooking. 5. As soon as the chicken pieces are golden brown and cooked through, transfer them to a platter, garnish with the lime wedges and red chillies and serve immediately. 1. Instead of cutting up a chicken into parts, I opted to use chicken wing parts. 2. *The cookbook author notes that “Coriander roots are more intensely flavoured than the leaves, but the herb is not always available with the roots intact.” According to Fine Cooking, “If you can’t find any cilantro root, substitute chopped cilantro stems with a few leaves mixed in.” I read in several places that an appropriate substitution is two cilantro stems for each root, since coriander stems are not as potent as the roots. 3. 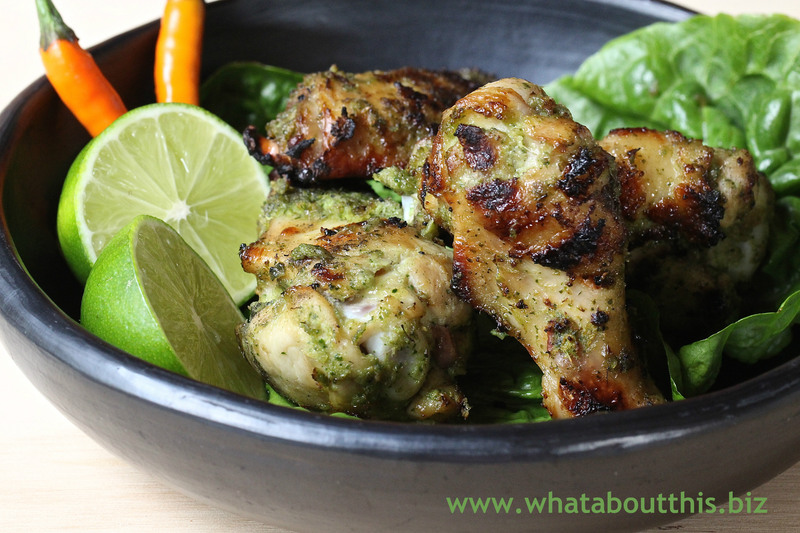 My marinade looked greener than the photo in the cookbook – I added too much cilantro. 4. Palm sugar is sold in hard-packed cakes at Asian markets. Grate the cakes to measure and use. 5. I let the chicken marinate in the refrigerator overnight and for an additional half-day.